May 16, 2009 is truly a day to be remembered. 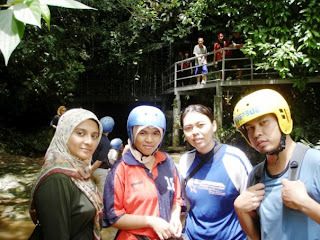 I went to Gua Tempurung for caving experience, to Sungai Kampar for whitewater rafting and Stadium Putra for AF Finale. I even have trouble digesting this in one sentence and let alone, doing it. I thought myself mad. But, determination really sees me thru it. Err..rather, the power of the driver for the day, Izan see us thru it. Thanks Izan! 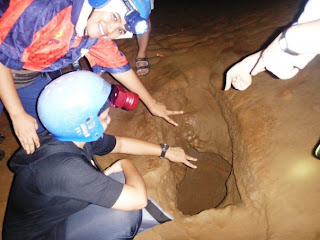 We have planned for this caving and rafting for some time. 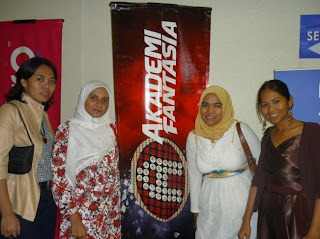 I have also discussed with my housemate to go and watch AF Finale. Since my housemate’s company is one of the sponsors for AF, she cud easily get tickets for the concert. I’m not really a fan of AF but watching AF Finale is always on my wish list. We pushed off from KL at about 730am. 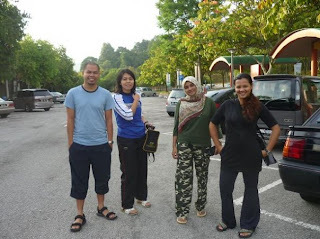 We met at Taman Melati and went to Gopeng with one car, Izan’s car. There are 5 of us. 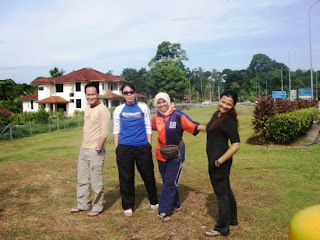 Me, Izan, Dell, Ida and June. We drove to Sg Buloh R&R to meet with the rest of the team. After a short meeting with Reha, the organizer and also with other team members (thanks Aiman for introducing me to other members with ur loud announcement..hehe), having breakfast also there, we convoyed to Gua Tempurung. Reha still made some jokes bout a team being left behind during Slim River trip, which is us, of course. Hmm..Reha, did u forget us purposely, or izit a joke to us? Ape2 pun, kitorg tak sesat this time. Yeay!! 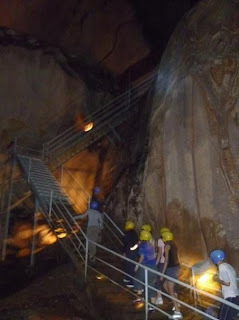 We reached Gua Tempurung at bout 10am. There are bout 27 people on this trip. Mostly comes from KL. We only get to know few of them. Mac is our tour guide of the day. The trip started with dry part. There are so many stairs that u lost count on them along the way. Also, since it’s a closed area, and sooo many people inside, it’s like a sauna in there. You tend to sweat so very easily. 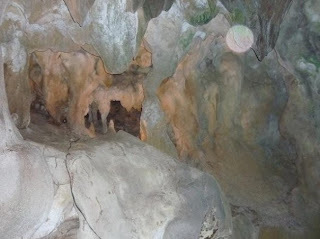 Mac wud stop at certain checkpoint and explained to us bout all the wonders of stalagmites and stalagtires. The key word here is, “Use your own imagination”. 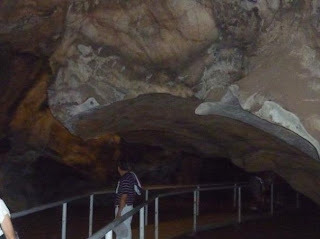 There are many shapes of rocks inside and it cud be anything u want it to be. My favorite part of the cave is definitely the wind tunnel. Hey, it’s natural k. the wind tunnel is formed due to the pressure difference in between the two chambers. It’s really windy and refreshing here. Too bad we have to move to another chamber. After about one hour in the dry area, we headed to wet area. 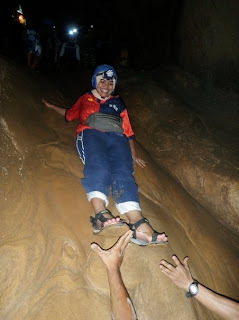 For this, we need to slide down and for me, it’s fun! 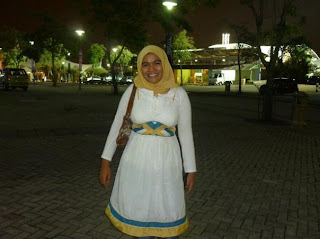 Maybe not to some people and also, do NOT wear whites, you will regret it. Just follow the direction given and you’ll be safely landed on the ground. If not, there people standing at the bottom to rescue you, no worries! And if you think that’s adventurous enuff, that’s actually the starting point of all your fear. Imagine going thru a small hole where it fits only your body and for big people, you can just shake your body and still safely get thru. You’ll discover an area filled with water, but it’s just enuff to wet your shoes. Just ankle deep. This is when your headlamp is very useful. 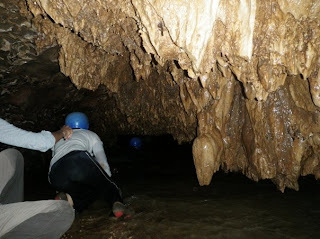 Not really far ahead is a small opening cave that requires you to crawl down. Ok, that’s not scarry enuff, remember the water that’s just ankle-deep? It’s now your knee-deep. When you crawl, it’s slightly above your head. 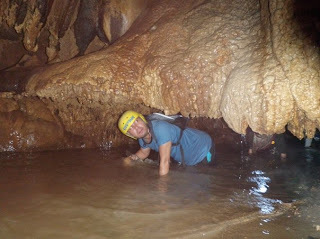 For claustrophobia, this is definitely NOT for you. And if you think that this crawling part is only a short distance, nope, wrong again. There was a time that I thot we cud never see the end of this trip. 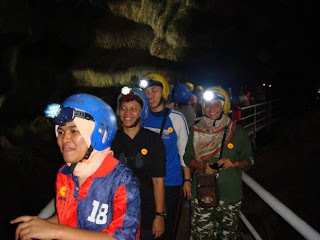 With tiredness, crawling, had to watch ur head and body, so that not to bump the cave above you, sooo penatt..at last, we finally reached the end of the tunnel when we some lights. Here, you will feel relieved beyond your imagination and thot what a fun trip it is, believe me! 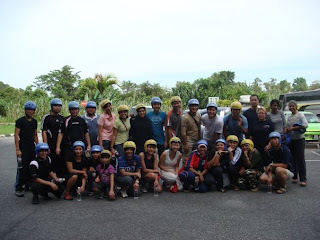 After a fun caving experience, we headed to Sg Kampar for rafting experience. Well, this is my third time, so I knew what to expect. 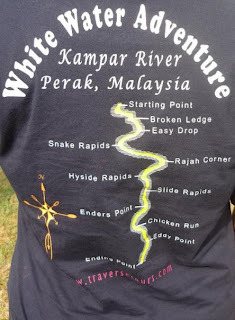 Initially, I really didn’t have the heart to do rafting at Kampar coz I heard it was not really adventurous compared to Slim River and KKB, but anyway, since we are here, why not do it? Just for the fun of it. Yup, we got FUN! When we reached Sg Kampar, it has already started raining. I wanted to jump for joy! Rain means more water in the river, hence more excitement. Double yeay! But first, we need to feed our hungry stomach after a tiring journey at Gua Tempurung. The food was delicious! Or maybe because we were so damned hungry? Mac briefed us again on the safety and whatnots. For me and my friends, we have been hearing this for the third time, so kinda boring gak la, but since they are many beginners, they have to do it. It doesn’t hurt to remind people, right? 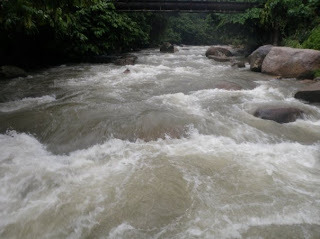 The rain was pouring heavily when we started rafting. My friends and I were in the same raft. 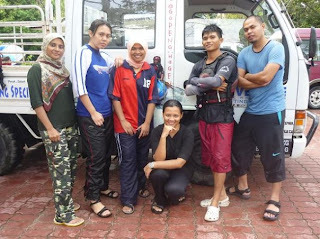 At first, I wanted Aiman, my regular paddler partner to join us too, but Reha wanted him to join beginners’ raft, so that we were evenly distributed. 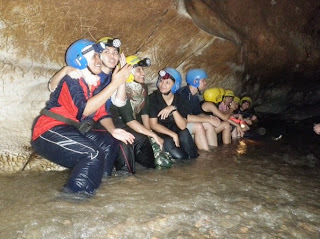 So, takde la photographer dalam raft coz he has waterproof camera. Sayang sungguh! 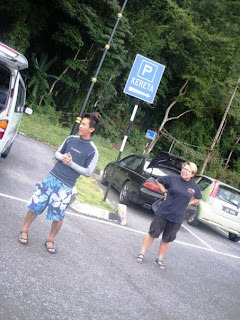 Bole tak nak pinjam your camera for KK trip, Aiman? 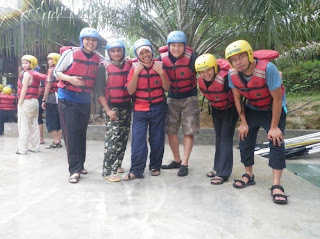 Hehe..
June is our new member in the raft this time but he was no beginner. 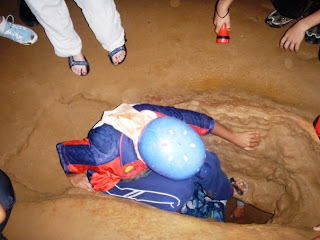 He had rafted at KKB before. Our skipper for the day is Tats. Compared to other skippers we had, he seems the quietest one. June, seems to rock the raft. He’s the one shouting for command (err..Tats gave the command but he shouted it), and the harder he shouted, the harder we paddled. And we laughed our heart out. Anyway, good job june, maybe you shud join us the next time. Since it rains, the water was really fast, and it makes the rather boring rafting route awakens to life. 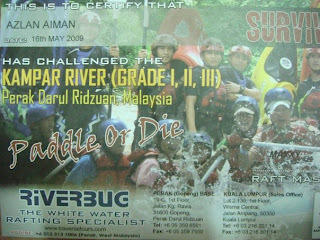 This is the certicate we got after the rafting trip..first time dapat cert after third time rafting nihh..But it's not my name on it.. 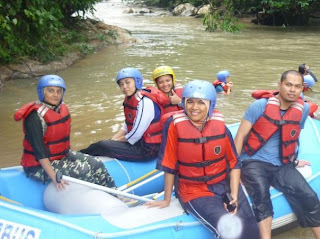 So, rafting ended at about 530…we rushed off to KL to catch AF Finale, which started at about 9pm. We also need to stop at R&R to bath, change and pray. We took off from Tapah R&R at 7pm. 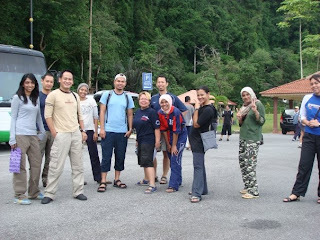 Almost all our rafting friends, including the skippers, knew we were heading to Stadium Putra that nite but they were not confident enuff we wud make it. And to tell u the truth, even I, myself didn’t have the faith to say we wud be there until the moment we parked our car and raced to the hall. It was already 855pm when we got there. Thanks to Izan and her marvelous driving skill. It rained heavily on the hiway and I prayed hard that we’d be there on time. When we entered the hall, AC Mical is already standing the center stage for opening remarks. We were still looking for our seats. But everything just went well. Phewww..but sadly, the concert was a so-so..thinking back, if we knew the concert wud be like that, we wudn’t rush and just stay at home watching on TV. But at least, one of my wishlist dah cancel out. When we left Stadium Putra, my eyes are so heavy. Thanks Aida for driving us home. At the end of all this, I thot, hey, what a great day! Adrenaline rush from the moment I opened my eyes that morning to the end, when I closed my eyes again that nite. I was smiling in my sleep…. 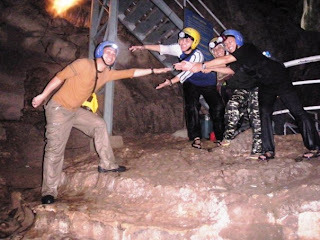 best nampak korang rafting & caving... bila nak wat trip to kelate plak... kb ke gunung stong ke..
one day i will join u for white water rafting, but not the caving tho, me a claustrophobic!!! 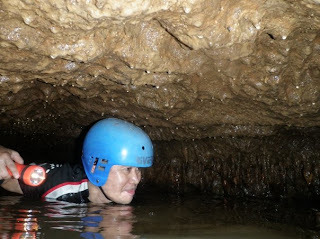 i cant breathe even in the Smart Tunnel apatah lagi in a hole small enough only to fit yr body crawling on yr knees with water around you arghhh!! gile aaaa! haha..nique, it was an amazing experience tau...let's do water rafting together the next time..i'll announce in fb..stay tuned!